This airplane cruised into my bedroom one evening at bedtime. "To Jenny Denton from Hyrum"
That morning when I gathered lunch boxes, I discovered that Hyrum's box not only had food still in it (not uncommon), it had never been opened the day before. Sandwich--check. Cucumbers--check. Clementine--check. Water bottle--full. The last straw that full lunch box. The kids were sitting at the bar eating breakfast when the Mom wrath erupted. "Hyrum, from now on you are making your own lunch. I'm done wasting my time making you a lunch you don't eat. It hurts my feelings and I have other things I can do with my time." He hung his head as he headed out the door for school. I was straightening up the kitchen that same night when Hyrum came downstairs and starting rifling through the fridge. "Rum, it's bedtime and you've brushed your teeth. Head up to bed." His response surprised me. "I'm making my lunch for tomorrow, " he simply stated, eyes still cast down. Surprised, I left him alone in the kitchen to make his lunch. My heart strings played a tender mother's song. That boy is so sweet to his mom, even when he's kinda naughty. 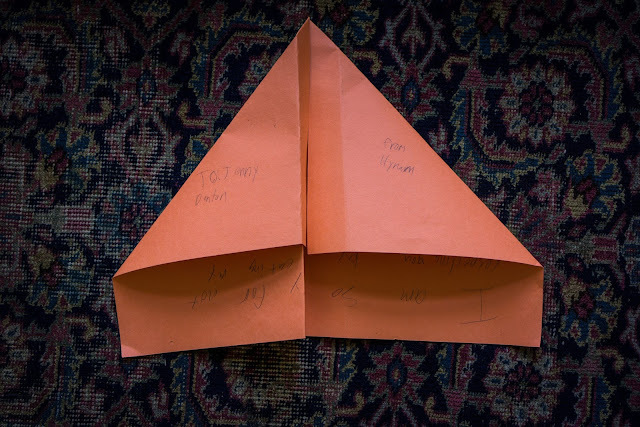 Instead of walking into his room and sweeping him off his bed into a tight hug, I fashioned my own airplane from a small sheet of paper, sneaked around the corner into his room where he was reading Harry Potter 6, and threw my sorry excuse of an airplane. It crashed straight to the floor as I scurried back down the hall. "Sometimes we make mistakes and then feel bad about them. 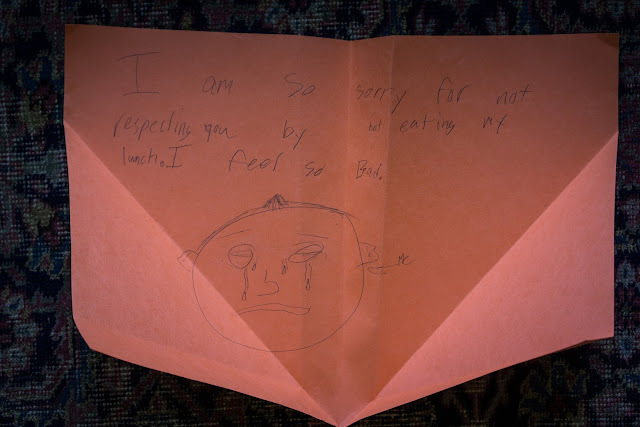 Thank you for your apology. I can tell you're really sorry. If you make your own lunch for the rest of the week, then I will do it again. Love, Mom." Moments later a third airplane appeared on my floor--a tiny scrap hastily torn from the closest piece of paper he could find. That's when I couldn't hold back the "squeeze-the-stuffing-out-of-him" hug and I ran down the hall, scooped that nine-year-old boy off his bed (book and all), and squeezed the stuffing out of him. Aw. Such a cute guy. Cute boy. Is he really nine? That's hard for me to believe.